25 June 2018 Noémie Goudal is known for her ambiguous landscape images, which explore the relationship between nature and artifice. Telluris extends the artist’s ongoing inquiry into the ideas of ancient thinkers, who sought to explain complex natural phenomena through unifying scientific theories. An architectural wooden structure fills the Gallery’s main space, housing two related series of black and white photographs showing fictitious mountainscapes. Composed of skeletal cubes, the structure provides a network of corridors through the space as well as a visual framework for the images. On a crowded preview night, this maze forces unexpected social encounters as viewers negotiate space and inevitably clash in their attempts to reach each of the images that hang from the wood. The dense labyrinth opens out into a courtyard, where a triptych of photographs showing cubes stacked in the desert is illuminated by the skylight above. Many of the cubes are haphazardly stacked, undermining the inherent stability of this geometric form to the point of near collapse. The cubes represent the idea of a mountain, a reminder of tectonic activity deep in the Earth’s crust. On route to these monumental images, one passes images of jagged rock formations. These geological formations first appear plausible but close looking reveals them to be the result of a precise staging: mirrors positioned on tripods at different distances from the rocks transform reality into a series of reflections suspended in natural space. Elsewhere, a Swiss mountain range seems to dissolve across a grid of twelve images, the product of another intervention by the artist, this time involving water soluble paper. Downstairs, in the basement of the Gallery, Goudal presents a new sculptural installation involving a Wheatstone stereoscope flanked by a pair of carousel slide projectors and rear projection screens. The stereoscope uses a simple pair of mirrors at 45 degree angles to the user’s eyes, each reflecting a seemingly identical image of a rock face located off to the side. Fusing the two images, the brain accepts them as a singular view of a three-dimensional scene, propelling the viewer into a rock face where plants push through crevices to thrive against all odds. The rhythmical “click” of the moving carousel usually signals progression in an image sequence but, here, the “same” image is repeated over and over, suspending the viewer in a moment, but also time to process a slightly different three dimensional composition each time. To enter the installation one must pass through a curtain; a gateway to the rock face. As well as concealing the stage, curtains are used in theatre and cinema to heighten the sense of anticipation and expectation, a technique that Goudal puts to good use here to hold the viewer in suspense. It is noteworthy that the artist has produced sets for dancers and, more recently, for theatre. These influences can be felt across the work, as can the impact of the artist’s mother and father: a theatre manager and architect of historical buildings respectively. 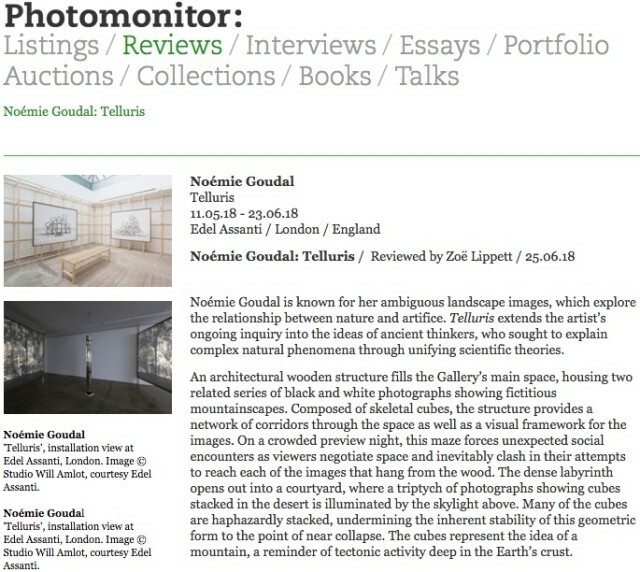 In creating two distinct environments for her images, Goudal involves the viewer in the theatre of the natural world, revealing and concealing in equal measure. Noémie Goudal Telluris, was on view at Edel Assanti, London from 10 May to 23 June 2018. Noémie Goudal Stations continues at The Finnish Museum of Photography, Helsinki, Finland until 12 August 2018. Musée des Beaux-Arts Le Locle, Switzerland will present a new solo exhibition by Noémie Goudal in 2019.